His Excellency the President of Umm Al-Qura University, Prof. Abdullah bin Omar Bafail, has honored the Dean of the College of Public Health and Health Informatics, Dr. Wahib ibn Dakhilullah Al-Harby, on the occasion of the end of his term as Dean of the College of Public Health and because of the efforts he exerted during his tenure as dean. This occurred at the University President's Office at Al-Abdiyyah in the presence of the UQU Vice President for Development and Entrepreneurship, Dr. Hany bin Osman Ghazy. His Excellency praised the efforts of Dr. Wahib Al-Harby, which greatly improved the learning outcomes of the College of Public Health and Health Informatics and its administrative and research environment. His Excellency the President of the University stated that this development was a result of the support that the university and its branches received from the government of the Custodian of the Two Holy Mosques, may Allah support it. He stressed that this achievement is evidence of the harmony and cooperation enjoyed by the university. His Excellency the UQU President wished him success in his coming work and that Allah may reward him well for his previous work. 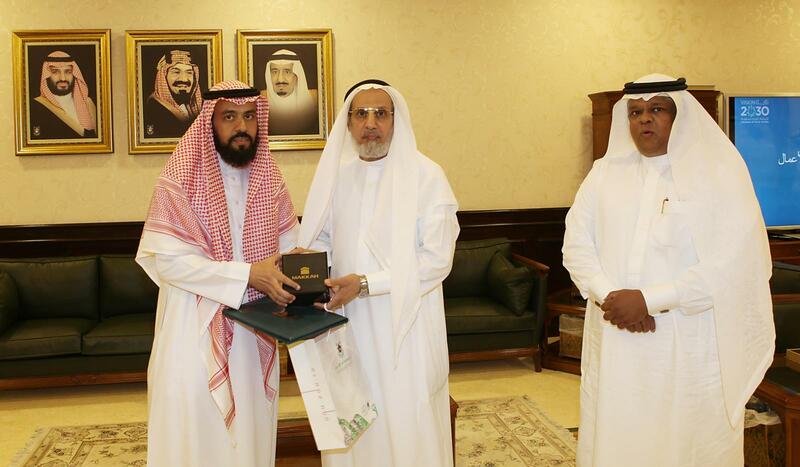 The Dean of the College of Public Health and Health Informatics, Dr. Wahib ibn Dakhilullah Al-Harby, praised the enthusiasm and care of His Excellency the President of Umm Al-Qura University, Prof. Abdulalh bin Omar Bafail, for receiving and honoring him for his work as dean of the college. He pointed out that these efforts have been achieved because of the support and guidance received from his Excellency to upgrade the educational outcomes and environment.